Yo Gabba Gabba Live @ the Majestic Theatre Mar. 16th! Yes! There is still time to get your tickets!!! There is something about these 5 characters that I...I mean, my children love. :) Maybe it's the hip-hop influences and Mos Def cameos that get me. But, who also doesn't love the Lovely, Love My Family Song by the Roots? 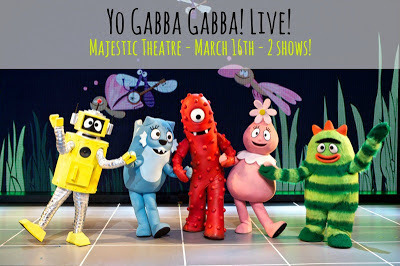 Anyhow...this show is guaranteed to get you out of your kids out of their seats and you smiling for days! DJ Lance Rock will bring these characters to life and there may even be a visit from hip-hop legend, Biz Markie! (Oh Baby...You!). You can purchase your tickets to a 2pm or a 5pm show from Ticketmaster, starting at $25 each. Still not convinced, check out the event website for pics, video and FAQ's. Or check out the blog, Insights by April, who is hosting a giveaway for the show! And be ready to have some fun! Get those sillies out! FYI: Looking for parking? Park in the Houston Street Garage, it's on the same city block as the Majestic Theatre, but the entrance is on College St. You'll thank me later!